I just installed Ubuntu 16.04 and the Gnome shell 3.18.5. 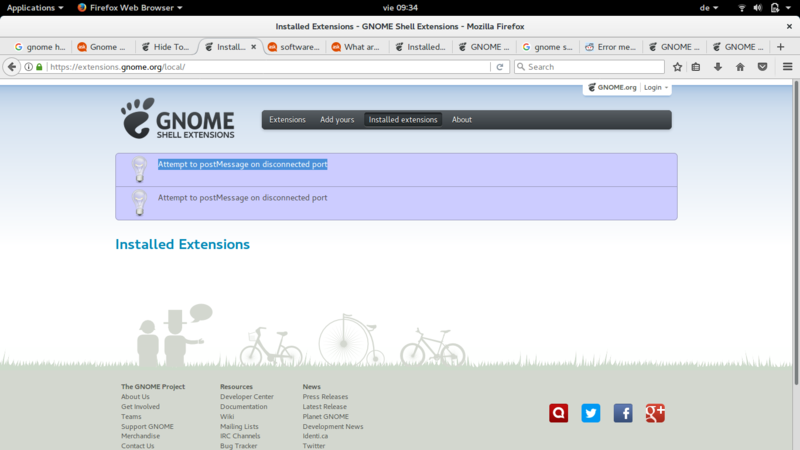 I'm new to the whole 'Gnome Shell extension'-thing (I use my browser to install user-made extensions?) .. I can't seem to do anything on that website anymore. When I view an extension on the website I can't find any install button or anything (but then I'm not really sure how it is supposed to work). I tried to install the extension "Hide Top Bar" and also have the Gnome Tweak Tool installed. How would I install that tool with the command line? Well, I found the answer, I didn't have chrome-gnome-shell installed. I checked my Firefox extensions (type about:addons in the firefox url bar). The GNOME Shell integration was listed there. Now there is a on/off slider at the top right on the page of each extension. Somehow it was missing on my 16.10 system, which was fixed by adding the PPA above.